Beastie Boys - Paul's Boutique. Vinyl LP. Bleep. 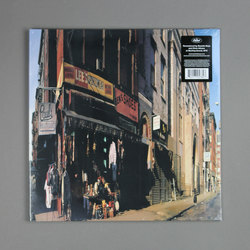 Almost thirty years on from its release there is still nothing quite like Paul’s Boutique. The 1989 sophomore LP from the Beastie Boys remains a high-point for hip-hop and the art of sampling more generally. Put together at a time when artists didn’t have to worry about things like sample clearances, the NYC trio and producers The Dust Brothers had free reign to create beats from as many scavenged sounds as they wanted. It makes for an endlessly inventive and original album - and one that, for all its lofty ambition, doesn’t forget to bring the party (‘Shake Your Rump’, ‘Hey Ladies’). The best of Beck, The Avalanches and DJ Shadow can claim a direct lineage to Paul’s Boutique.